The money has been raised over the last year by the Sandwell Hospital League of Friends who run the shop in the main entrance to the hospital. Among the items the volunteers have brought for the hospital is a £8,300 bladder scanner which will be used by patients in the surgical day unit. The scanner detects whether patients who have undergone a procedure under general anaesthetic still have urine in their bladder, allowing doctors and nurses to deal with any problems before it leads to infection or complications. Among other items the volunteers have funded include contributing more than £13,000 to the cost of a Mylab 25 Gold Scanner for the Emergency Assessment Unit; £20,000 towards a new liver scanner which gives patients instant results and avoids the need for an uncomfortable and potentially harmful biopsy; and £390 of sensory toys for the children’s ward to name but a few. 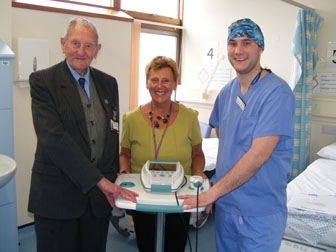 Richard Samuda, Chairman ofSandwelland West Birmingham Hospitals NHS Trust, said: “On behalf of the board, staff at the hospital and the patients who will benefit from the use of the new equipment I would like to say a big thank you to the League of Friends for their generous donation.